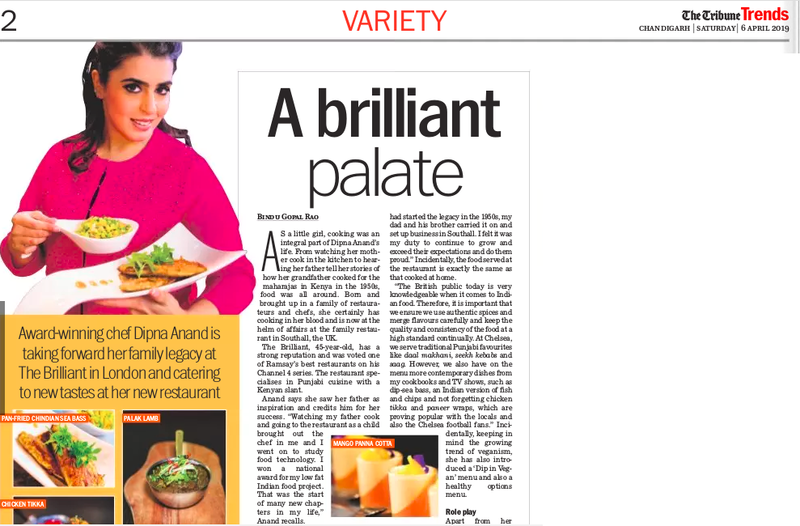 Dipna Anand is an award winning celebrity chef who is continuing her family legacy of ensuring that the flag of Indian cuisine flutters high in England. 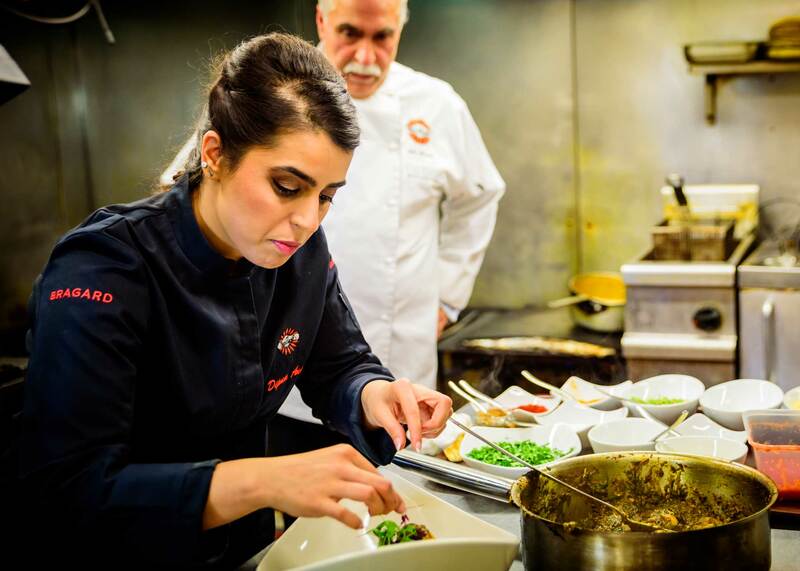 As a little girl, cooking was an integral part of Dipna Anand’s life. From watching her mother cook in the kitchen to hearing her father tell her stories of how her grandfather cook for the Maharajas in Kenya in the 1950’s, food was all around. Well, having been born and brought up in a family of restaurateurs and chefs, she certainly has cooking in her blood. The family restaurant in Southall called The Brilliant has been open for 45 years has a strong reputation and was voted as one of Ramsay’s Best Restaurant for his Channel 4 series. The restaurant specializes in Punjabi cooking with a Kenyan slant. As Dipna started growing older, she became even more interested and developed a deep passion for the industry and knew this is what she wanted as a career. “I saw my dad as my inspiration and feel my success is due to him, up until today I tell people ‘I want to be just like my dad’. Thus watching my father and going to the restaurant as a child brought out the chef in me and I went on to do Food Technology at A ‘Level, at which point I won a National Award for my low fat Indian food project for the subject, this was the start of many new chapters in my life.” She then pursued a degree in the subject of Hospitality and Catering with Food studies at The University of West London that she passed with First Class Honours and was offered a Masters Scholarship in Catering. Whilst she was doing her masters she was offered a position at the same university as a chef lecturer and up until today she continues teaching, specializing in Indian cooking. “I also have my own cookery school which I run from the restaurant and my courses are not only informative but fun and exciting for the candidates at the same time. I love working with my family in the restaurant businesses and meeting customers and generally just the whole environment of working in this buzzing hospitality industry. I recently opened my new restaurant called Dip in Brilliant which is in Chelsea, there I serve Punjabi specialities and also have on the menu Indian contemporary dishes.” Her first cook-book titled ‘Beyond Brilliant’ launched in 2014 and her second cook-book released in September 2018 is titled Dip in Brilliant. Having been in the food business for such a long time Dipna says she did not feel any pressure on herself but looked at it as an opportunity to grow their restaurant brand even further. “My grandfather had started the legacy in the 1950’s, my dad and his brother carried on the name and set up the business in Southall so I felt it is my duty to continue to grow the exceed their expectations and do them proud.” Incidentally the food served at the restaurant is exactly the same as what her father would eat at home. “The British public has now become very knowledgeable about Indian food therefore it is important that we ensure we use authentic spices and merge flavours carefully and more importantly keep the quality and consistency of the food at a high standard continually. In my Chelsea restaurant, we serve traditional Punjabi favourites like Dal Makhani, Seekh Kebabs and saag however we also have on the menu more contemporary dishes from my cook-books and TV shows, such as Dip-Sea Bass, an Indian version of Fish and Chips and not forgetting chicken tikka and paneer wraps which are proving popular with the locals and also the Chelsea football fans.” Incidentally keeping in mind the growing trend of veganism she has also introduced a ‘Dip in Vegan’ menu and also a healthy options menu. Apart from her restaurants in Southall and Chelsea, Dipna is a guest lecturer at the University of West London and has done a cookery show on B4U Music called Dip in Kitchen. She also works with a contract catering company under three of their brands, Levy, Restaurant Associates and Payne and Gunter and works with The Ritz Club London for whom she have developed a bespoke menu for their club guests. “I carry out frequent food demonstrations at events and exhibitions including food shows and also run my very own Cookery School in Southall. I have recently launched a ready meal concept called Dip in Box and in the future hope to venture out further into this market and see my meals on supermarket shelves.” As a company she is part of a campaign called Just Eat which encourages consumers to ask where their food on their plate comes from. Prince Charles is a supporter of the campaign and has also visited them in support of this. “We try to source ingredients as locally as we can however for some specialist ingredients this is not always possible. Spices for example we buy are from a brand called Rajah and their spices are made in India. Some spices we make ourselves for example the garam masala, which is a 15 spice masala recipe created by my grandfather over 75 years ago.” Looking ahead Dipna believes that this is the right time to venture out. “As I was quite pre-occupied before I was unable to focus on my international associations as much as I would have liked to however now seems to be a good time as my restaurant has launched and my second book released. I would also like to develop my own ready meal range in the future as well as create a food show which focuses on my journey as chef, maybe a food trail from London to India, I think this would be a much loved idea,” she concludes.